None of the major liberal mainstream media outlets put the $1 million in damages figure in their headlines. 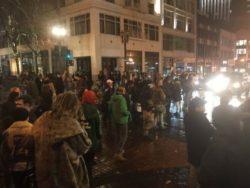 Instead, headlines ranged from “Riot declared in Portland, Oregon amid new wave of anti-Trump demos” (CBS News) to “Anti-Trump protesters take to the streets in many cities for a third night” (Washington Post) and the like. Now that Ammon Bundy and his inner circle have been arrested, with one killed in a shootout with police, you would think it would be the end of the standoff. But, that is not the case, apparently. 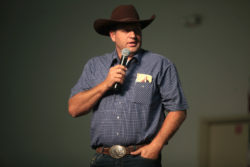 Specifically, Shaun King was fooled by the fake Twitter account of Ammon Bundy, a Nevada rancher who is leading the effort to occupy a federal building in a federal wildlife refuge in Oregon.